Wayne High School senior Vincent Statzer recently earned Scouting’s highest medal, Eagle Scout. 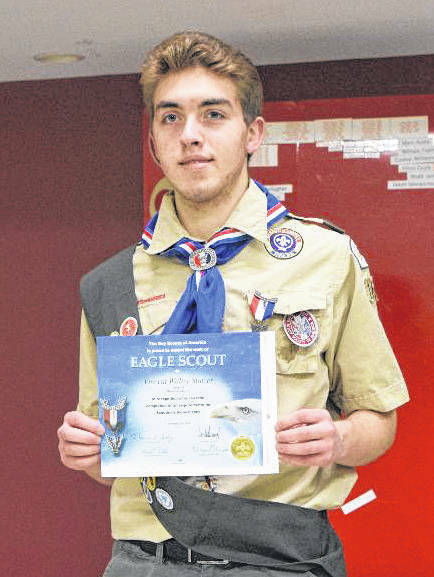 HUBER HEIGHTS — Vincent Statzer, a senior at Wayne High School and son of David and Diane Statzer was awarded the medal of Eagle Scout. Eagle Scout is the highest achievement attainable in the Scout program. Only four percent of boy scouts are granted this rank and only after a lengthy review process. To achieved the rank of Eagle Scout, one must be very active in scouting after achieving the rank of “Life Scout,” which Vincent demonstrated that he lives by the principles of the scout oath and earned a minimum of 21 merit badges. This includes an extensive service project that Vincent had to plan, organize and manage.